The historical marker process in Texas begins at the county level with the Montgomery County Historical Commission. The Texas Historical Commission (THC) accepts nominations for historical markers each fall for the following calendar year. IMPORTANT: The next application period for 2020 markers is from September 1 through November 15, 2019. DO NOT BE LATE! Check the THC website to download an application form but contact the MCHC chair Larry Foerster now to begin the research process. Please contact the Montgomery County CHC Chairman Larry Foerster for assistance in completing your application. 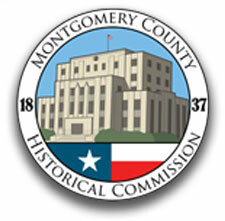 It is recommended that the application be submitted to the Montgomery County Historical Commission before August 1. Medallions and Markers awarded by the THC’s predecessor, the Texas State Historical Survey Committee. all required supporting documentation as required in the Application Requirements (see below). Only complete marker application packets that contain all the required elements can be accepted or processed. Any individual, group or county historical commission may apply to the THC for an Official Texas Historical Marker. A completed application form duly reviewed and approved by the county historical commission (CHC) in the county in which the marker will be placed. Application and text must be in the form of Word or Word-compatible documents. Required font style and type size are a Times variant and 12 point. Narrative histories must be typed in a double-spaced format and include separate sections on context, overview and significance. The narrative history must include documentation in the form of reference notes, which can be either footnotes or endnotes. Documentation associated with applications should be broad-based and demonstrate a survey of all available resources, both primary and secondary. Immediately upon notification of the successful preliminary review of required elements by the THC, a non-refundable application fee of $100 is required. The fee can be submitted to the THC within ten working days of application receipt notification. A detailed floor plan for each floor of the structure, if a residence or building. The floor plan must include notations on the use of the room (bedroom, parlor, etc.) and on where changes have been made over the years (i.e. back porch added 1924). Floor plans can be sent separately to the THC, provided they are on letter-size paper and include the required notations. Incomplete floor plans will not be accepted. A detailed site plan of the property, showing all major features, such as outbuildings, sidewalks, driveways, significant landscape features, etc. At least one historic photograph of the structure. One current photograph of each elevation of the structure. 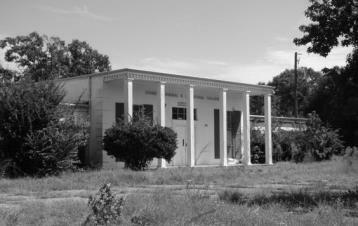 Prior approval by the THC for the Historic Texas Cemetery designation is required. Note that the designation process must be complete by the time the marker application is submitted to the CHC and that the HTC designation does not guarantee approval for an Official Texas Historical Marker. 1. Potential sponsor checks the THC web site for current basic information on the Official Texas Historical Marker Program. 2. Sponsor contacts the CHC to obtain marker application form, to review basic program requirements and to discuss county’s review process and procedures, which differs from county to county. The THC does not mandate a specific review process at the county level, so the sponsor will need to work closely with the CHC to be sure all local concerns and procedures are addressed properly. The CHCs cannot send the application forward until they can certify that the history and the application have been adequately reviewed. 3. CHC reviews the marker application for accuracy and significance, and either approves the application or works with the sponsor to develop additional information as necessary. 4. CHC-approved applications are forwarded online as a Word document to the History Programs Division of the THC. Once the application is received by the THC, additional notifications and correspondence will be between the CHC contact and the THC staff contact only, unless otherwise noted. 5. THC staff makes a preliminary assessment to determine if the topic is eligible for review and if all required elements are included. Upon notification the application has been accepted for review, a $100 application fee is due within ten days. 6. Eligible applications receive further review, and additional information may be requested via email. Failure to provide all requested materials as instructed in 45 days, unless special conditions are approved by the THC, will result in cancellation of the application. CHC and sponsor notified via email of approval and provided payment form; payment must be received in THC offices within 45 days or the application will be cancelled. Inscriptions written, with one review copy provided via email to the CHC contact only for local distribution as needed. Inscription review is for accuracy of content only; the THC determines the content, wording, punctuation, phrasing, etc. 8. Upon receipt of the inscription, the CHC contact provides additional copies as necessary for committee, commission or sponsor review and conveys a single response to the THC. 9. Upon receipt of emailed approval by the CHC, the THC proceeds with the order. If warranted changes recommended by the CHC are approved by the THC, staff will send a revised copy for content review. Because inscription reviews are for content only, only two reviews should be necessary to complete this step of the process. Additional requests for revisions are subject to approval by the THC, which will be the sole determinant of warranted requests for changes. Excessive requests for change, or delays in response, may, in the determination of the THC, result in cancellation of the order. 10. Only the authorized CHC contact — chair or marker chair — can make the final approval of inscriptions at the county level. Final approval will be construed by the THC to mean concurrence with any interested parties, including the sponsor. 11. The order is sent to marker supplier for manufacturing. Subject to the terms of the THC vendor contract, only authorized THC staff may contact the manufacturer relative to any aspect of Official Texas Historical Markers, including those in process or previously approved. 12. THC staff reviews galley proofs of markers. With THC approval, manufacturing process proceeds. Manufacturer inspects, crates and ships completed markers and notifies THC, which in turn notifies CHC contact. 13. With shipment notice, planning can begin on marker dedication ceremony, as needed, in conjunction with CHC, sponsors and other interested parties. Information on planning and conducting marker ceremonies is provided by the THC through its web site. 14. Once the planning is complete, the CHC posts the information to the THC web site calendar. 15. THC staff enters marker information into the Texas Historic Sites Atlas (atlas.thc.state.tx.us), an online inventory of marker information and inscriptions.